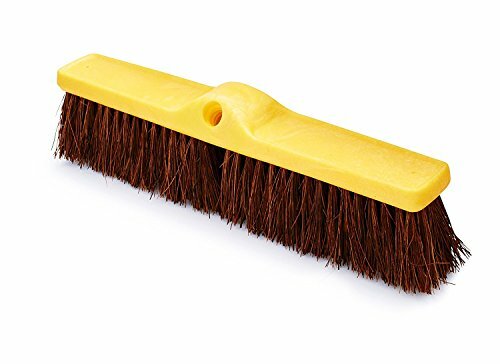 Rubbermaid Commercial FG9B1600BRN Palmyra Fiber Heavy-Duty Floor Sweep, 18-Inch Head Width, Brown. This floor sweep has heavy-duty polypropylene bristles that resist stains and odors. This sweep is designed for reliable use in the most demanding industrial applications. An angle brace adds support and stability. Handles sold separately. 18 inches long by 3.5 inches wide by 5 inches high. 1.5 pounds. Imported. This floor sweep has heavy-duty polypropylene bristles that resist stains and odors. The floor sweep has two-threaded handle holes on either side of block for even wear. This sweep is designed for reliable use in the most demanding industrial applications. An angle brace adds support and stability. Handles sold separately. 18 inches long by 3.5 inches wide by 5 inches high. 1.5 pounds. Imported.